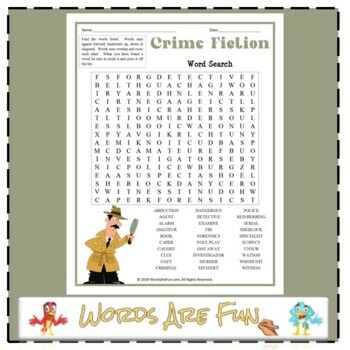 A word search puzzle featuring words associated with crime fiction. This puzzle is a great way to test your investigating skills with words. Use this sheet as part of your teaching curriculum, a treat for early finishers or just for fun. 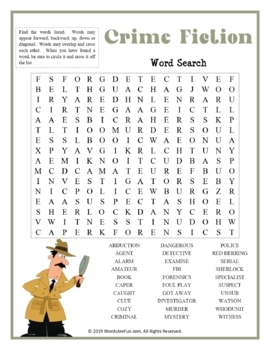 Word List: Abduction, Agent, Alarm, Amateur, Book, Caper, Caught, Clue, Cozy, Criminal, Dangerous, Detective, Examine, FBI, Forensics, Foul Play, Got Away, Investigator, Murder, Mystery, Police, Red Herring, Serial, Sherlock, Specialist, Suspect, Unsub, Watson, Whodunit, Witness.